In the legacy of early publications like Freedom’s Journal and Crisis Magazine, AAHGS publishes quality journalistic and scholarly research in the area of African American history and genealogy. Our contributors include individuals — advanced, intermediate or novice — writing on the frontlines of promoting, sharing, remembering, researching African American family and social history, and genealogy as scholars, journalists, family historians, or genealogists. Journal of the Afro-American Historical and Genealogical Society. The AAHGS Journal is an annual publication of original research written by scholars and family historians/genealogists. Read AAHGS Journal Submission Guidelines. You may purchase past issues of the Journal of the Afro-American Historical and Genealogical Society from our Online Store. Bi-Monthly Newsletter. AAHGS News uses journalism “to tell our own story” much like Russworm and Cornish, the publishers of the first black newspaper in America, Freedom’s Journal, did beginning in 1827. We are keenly aware that although the first slave ship arrived on North American shores some 400 years ago (1619), the majority of the histories, life stories, and genealogies of African Americans are waiting to be excavated, written, and published. Our goal is to encourage, assist, and provide an outlet in our pages to family historians/journalists. We are primarily a digital publication but hard copies are available on a limited basis. Click here for more information on obtaining copies of AAHGS News. Read AAHGS News Submission Guidelines. AAHGS Special Publications. AAHGS Special publications issued occasionally on noteworthy historical and genealogical topics. 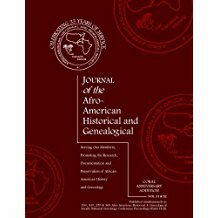 Permission must be obtained from the Editor of the AAHGS Journal to publish any articles, manuscripts, family group record sheets, and/or visual images that have been published in the Journal of the Afro-American Historical and Genealogical Society. In granting permission to publish materials previously published in the Journal of the Afro-American Historical and Genealogical Society, the AAHGS does not surrender its right to grant the same permission to others. The copyright law of the United States (U.S. Code, Title 17) governs the making of photocopies and reproductions of copyrighted material. Therefore, the publishing party assumes all responsibility for obtaining permission for use of any material where copyrights, literary property rights, or other forms of ownership of intellectual property may apply, in conformance with the provisions of the United States copyright law. Download the Permission to Reproduce Copyrighted Material form. (You must have Adobe Acrobat Reader® to view this form).